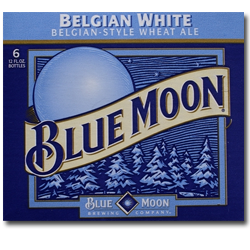 You’ll notice Blue Moon Belgian White Ale has a zesty orange fruitiness with a light spicy wheat aroma. The flavor starts crisp and tangy and ends with a coriander and orange spiciness. It will appear cloudy because it’s unfiltered for more depth of flavor.The Valencia orange peel gives a subtle sweetness to the beer. Our Belgian White has a slow finish of coriander and orange spiciness. "Beer Description" content and image are the property of Blue Moon Brewing Co. and are used for informational purposes only.